Your Idaho Falls dentists at Comfort Care and our staff of dental professionals are concerned about the effects of smoking and the use of tobacco on your oral health. Everyone knows smoking is bad for your health, but did you know it is a major contributor to dental problems as well? The effect of smoking on teeth and oral health is important information if you are a smoker. According the the American Dental Association, smoking and tobacco use can cause stained teeth, bad breath, and a diminished sense of taste. Smoking also lowers your immune system and is one of the most significant risk factors associated with gum or periodontal disease, and tooth loss. Also, the use of tobacco, especially smokeless (chewing) tobacco, increases your risk of oral cancer. 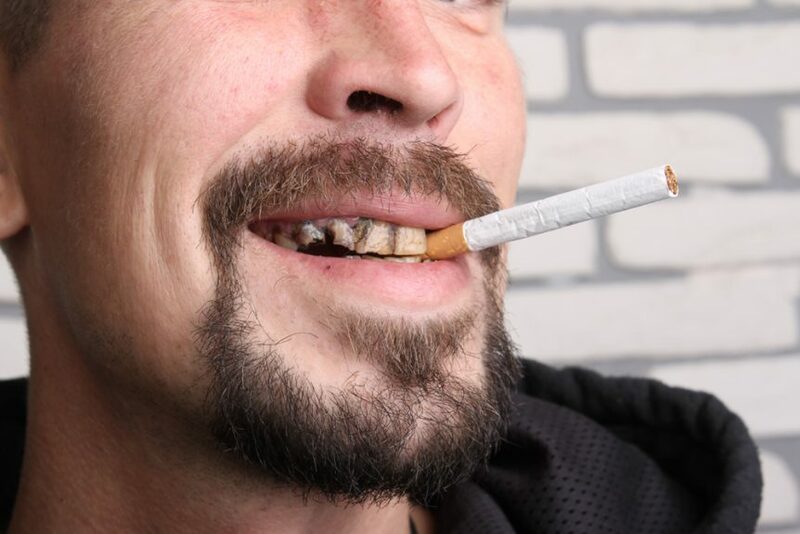 The effects of smoking can also lead to tooth decay and this poses a challenge with restorative dentistry as tobacco causes tooth discoloration, the results of treatment are not always ideal. In addition, gum recession can cause uneven margins on crowns and other restorations. Smokeless tobacco comes in many different forms and is called by many different names including: chewing tobacco; spit tobacco; dip; snuff; and snus. Snus is a Swedish type of smokeless tobacco that comes in pouches that a user puts between the upper lip and gum for about 30 minutes and then discards without spitting. This has become very popular in America because it is not as messy as chewing tobacco, dipping tobacco and moist tobacco because it does not cause excessive saliva during use. It does, however, still contain all the active ingredients of chewing tobacco. It is never too late to quit. While it’s best to quit smoking as early as possible, quitting smoking at any age will enhance the length and quality of your life (and your oral health). You can even inspire those around you to quit smoking! Learn from past experiences. Most smokers have tried to quit before and sometimes people get discouraged thinking about previous attempts. Think about what helped you during those tries and what you’ll do differently this time. You don’t have to quit alone. Telling friends and family that you’re trying to quit and getting their support will help ease the process. Expert help is available from the American Lung Association and the American Dental Association. Medication can help and your doctor or dentist is ready to help with the medication you may need. The seven FDA-approved medications (like nicotine patches or gum) really do help smokers quit. Follow the instructions for use exactly for optimum results. Every tobacco user can quit. We firmly believe that every smoker can quit. Each person needs to find the right combination of techniques for them and above all, they need to keep trying.